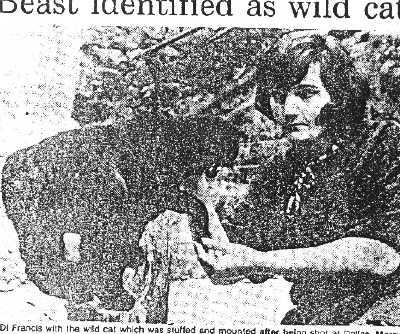 A Devon-based naturalist, Miss Di Francis, claimed yesterday she has discovered a new strain of Scottish wildcat. Miss Francis is waiting for verefication from the Natural History Museum in South Kensington. The stuffed carcass of the big cat, nicknamed the "black beast," which is taller and heavier than normal wildcats which are usuall tabby coloured, has been examined at the museum. Yesterday, a museum spokesman would not comment on the claim, but said a report would be published "within the next few weeks." The beast was one of three shot by farmers in the same area, near Forres, Morayshire, two years ago. Miss Francis, 41, or Torquay, ha sbeen trying to prove the existence of a new British wildcat. She said: "They are jet black in colour, and that makes them entirely new. "This is not the same as the Beast of Exmoor or Dartmoor."